The Eastern Partnership Civil Society Forum joins a statement signed by civil society organisations from Armenia, many of them members of the EaP CSF Armenian National Platform, calling on international organisations and democratic countries to support the struggle of the Armenian people for a better future rooted in democracy, in light of the alarming repression shown by the Armenian authorities during the last month. The document urges respect for the freedom of peaceful assembly by the Armenian state and places responsibilities on Serzh Sargsyan, President of Armenia, for any escalation of the situation and its consequences. On April 17, police employed “special means” of smoke grenades against tens of thousands of citizens that were demonstrating in response of the election of Sargsyan as prime minister in the Armenian parliament. At least 60 protesters were attacked, beaten and taken to police stations in the morning and kept there until the end of the session. In the following five days more than 600 protesters, including minors, have been attacked, severely beaten, taken to police stations and detained, often for more than 3 hours without investigative or judicial proceedings. Journalists are increasingly being subject to violence by police. 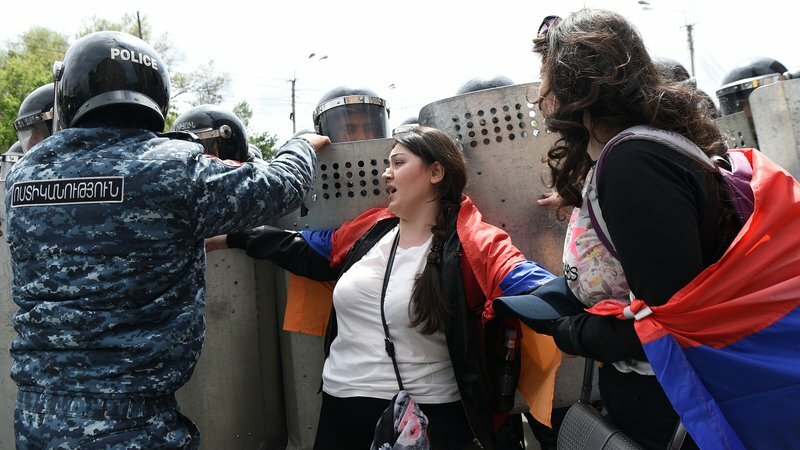 Since April 13, protesters occupied France Square in central Yerevan and peacefully marched through the streets, squares and bridges, paralyzing the traffic in the city and temporarily occupying government buildings. Civil society groups started a campaign in mid-march 2018 to oppose the potential nomination and election of Sargsyan and to prevent Armenia from turning into a life-long dictatorship. Until 2015, the Republic of Armenia had a semi-presidential governance system envisaging direct elections of the president of the country with maximum two terms of service. To maintain power after the expiry of his two terms, President Serzh Sargsyan changed the constitution through a rigged referendum held in December 2015.